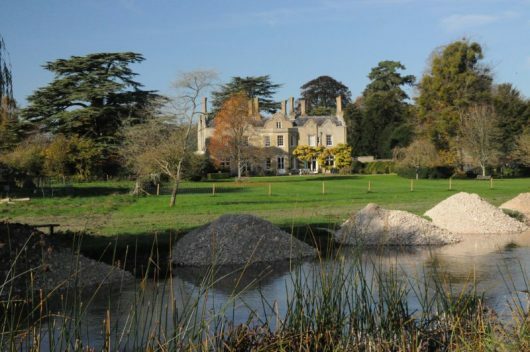 Photo 45 Anglers view of Bossington House as seen from ‘House Beat’ during the restoration. 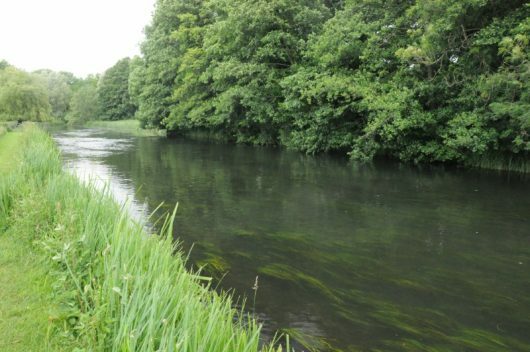 To date, generations of anglers and riparian owners have seen out their fishing careers on over-wide, slow-flowing chalk stream environments, artificially backed-up by weir structures and badly degraded by sedimentation and historic land-drainage practices. 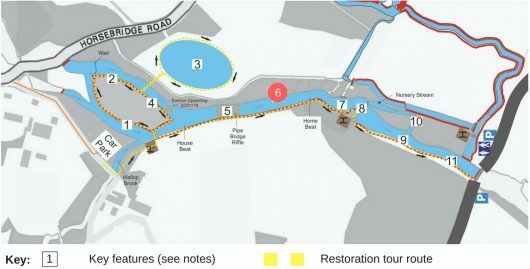 Failure to act due to ‘fear of the unknown’, tradition and a lack of awareness perhaps, is understandable given that river restoration in the T&I region is still in its infancy, coupled with the fact that to date, major schemes such as this are the exception rather than the rule. Change is being driven, however, by widespread concerns about climate change, water abstraction, Phosphate enrichment, heavy siltation, lack of natural salmonid recruitment and impacts on invertebrate fly life. The challenge throughout this project, therefore, was to deliver a demonstration site with a high-quality outcome to combat these many concerns, whilst simultaneously meeting the demands of a diverse and often conflicting set of stakeholders. “I hear what you say about weir removal being essential to habitat restoration and I understand that water levels will drop significantly, but we don’t want the river over-narrowed! I’d really like to preserve the existing width as much as possible, so we end up with majestic-looking dry fly water that adds to House Beats’ ‘sense of place’ ”…. The following photo-narrative explains what we did. 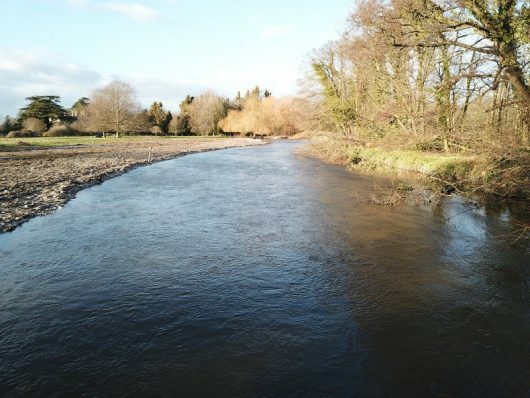 The following four images illustrate the long-term status of the river at this location seen both in summer and winter. Note the deep canal-like flows with beds of Ribbon weed or Eel grass (Sparganium emersum) blanketing the sedimented river bed. Photo 47 Downstream view of the weir-impounded ‘House beat’ as seen by anglers during a typical mid-summer trout fishing outing. 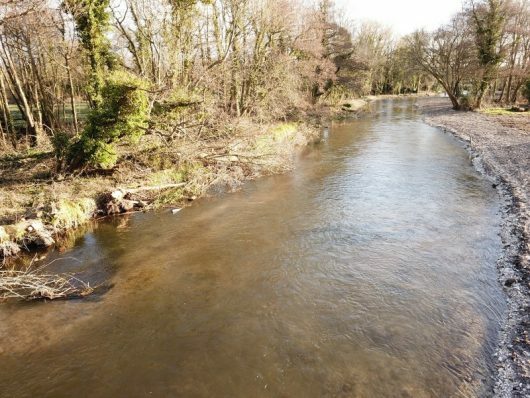 A key project objective was to replace the silt-loving ribbon weed with trusses of Water-crowfoot embedded in a gravel substrate scoured by streaming flows. Generations of Chalk stream angling visitors, accustomed to fishing degraded but heavily-stocked waters such as this, have probably been unaware of how alien and artificial these man-made environments are to native chalk stream flora and fauna and how differently they look and function when restored. It will be interesting to reflect on these changes with the members during the T&I’s project anniversary site visit during autumn 2018. Photo 48 Downstream winter view of the impounded, arrow-straight ‘House Beat’ reach prior to weir removal. These slow-flowing water bodies provide a final resting place for heavy sediment loads transported from the upstream catchment. Note the raised trapezoidal flood bund right of shot, constructed from dredged river bed material to retain impounded flows at a significant elevation above the natural flood plain. The natural flood-plain water meadow level is marked by the fence line centre-right of shot. 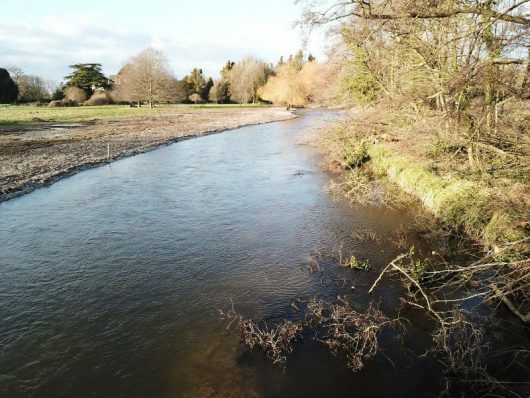 One of the key project objectives and justifications for contributory Environment Agency funding was the removal of the raised bund in its entirely to re-connect the river with its natural flood-plain. Photo 49 Upstream view of the impounded ‘House beat’ in winter. Dredged, dammed-up river channels act as huge sediment repositories. They appear dark, dead and bottomless due to the blanket covering of eroded agricultural soil, rubber tyre granules and chemical compounds flushed into the river from roads and agricultural land drains in the upstream catchment. These unwanted alien substrates combine with a cocktail of chemicals including Phosphates and Neonicotinoid insecticides to create a toxic and severely degraded in-stream habitat. Photo 50 downstream view of the start of works on ‘House Beat Central’ from Pipe Bridge crossing. Removal and storage of existing marginal vegetation for re-planting into the new bank margins. Grading down of the entire trapezoidal earthen bund to return the true R/H fishing bank back to its natural floodplain level. 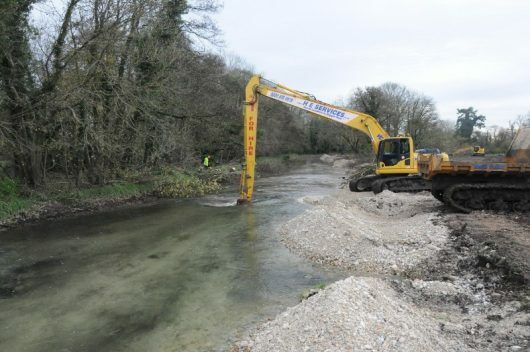 Placement of ten-tonne loads of gravel onto the lowered bank edge down the entire restoration reach. 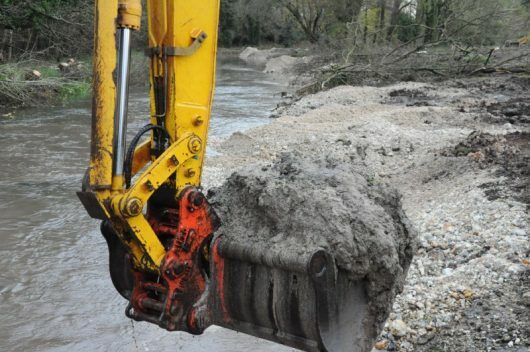 Removal of 1m deep bank-to-bank deposits of toxic sediment and ribbon weed roots from the river bed using a long-reach excavator. Chain-saw clearance of the dense stand of over-hanging Alder trees on the opposite L/H bank. 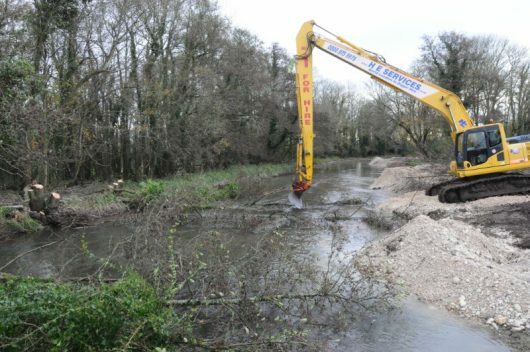 Removal of felled, over-hanging excess trees from the watercourse using the Long Reach excavator. 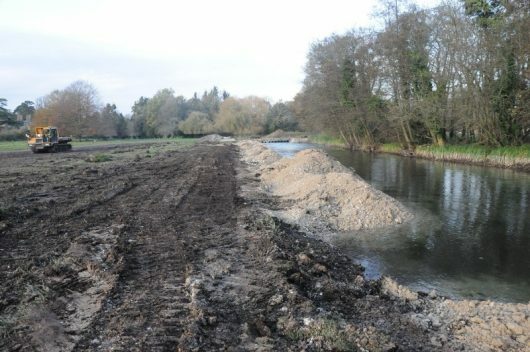 Installation of a continuous raised-gravel bund down the entire length of the reach on the opposite (non-fishing) L/H bank, to form a new sub-surface inside meander with back-water. Selective placement across and over the new sub-surface gravel bund with site-won trees (LWD) and felled woody material to create marginal inside meander habitat. 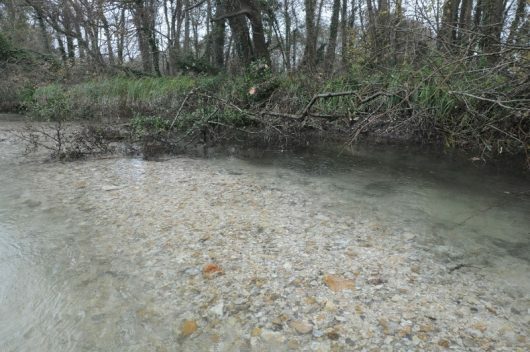 Re-dressing of the sediment-free river bed using site-won gravel to reinstate the gradient and form a new letter-box-shaped bed profile with pocket water and streaming flows. Excavation of the true R/H angler bank to form a new gravel-fronted outside meander. Re-dressing and grading of the new access bank with imported soil. In-stream planting of the entire reach with Water-crowfoot, Water parsnip and Starwort. Photo 51 Following weir removal the raised trapezoidal flood bund was removed to return the river bank to the height of its natural flood plain. 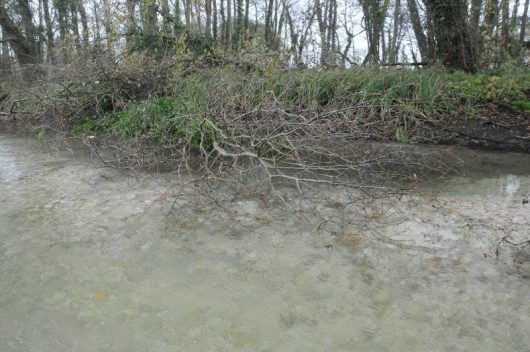 Long-term water levels in the previously-impounded channel are indicated by the white calcium stain on the opposite bank-side vegetation. Photo 52 10 tonne gravel deposits were placed on the edge of the sloping bank margin to provide a platform for the long-reach excavator to safely remove the extensive 1m deep sediment deposits, seen bottom left in the foreground. Photo 53 – 1m deep sediment deposits filled with the roots of Ribbon weed (Sparganium emersum) were systematically scraped out of the impacted channel down to hard bed. Photo 54 Several hundred tonnes of phosphate and hydrogen-sulphide-rich sediment deposits were excavated from the bed of this reach alone and transported in dumpers for grading into a nearby floodplain cavity. Photo 55 Over-hanging bank-side Alders were pollarded into the channel. Those not required for in-river marginal bank cover use, were transported away in tracked dumpers. 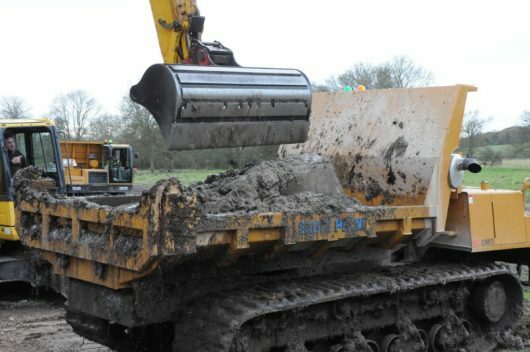 The use of a long-reach excavator with a trained and highly-competent ‘in-house’ driver was one of the reasons that an entire project on this scale could be delivered in just under 8 weeks. Photo 56 A solid gravel sub-surface bund was placed on the opposite L/H bank with the long-reach to form an extensive outward-curving inside meander feature. 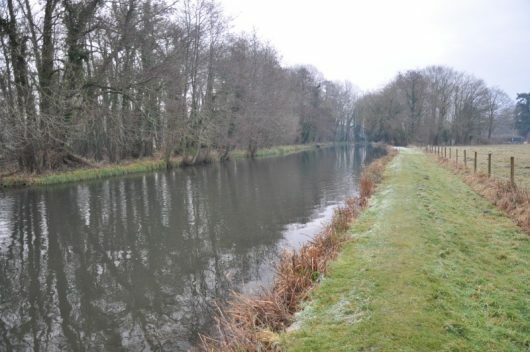 A free-flowing backwater channel was maintained between the inside sloping face of the bund and the base of the original bank to provide a valuable habitat refuge for water voles, swim-up fry and invertebrates. 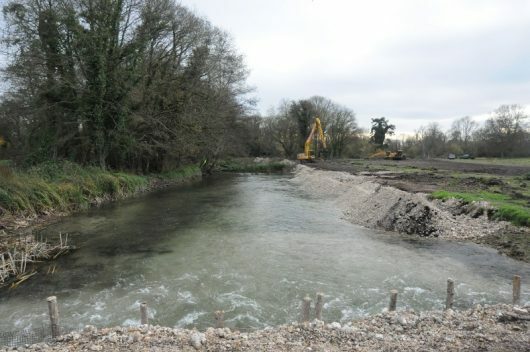 Photo 57 Tree deflectors were placed, pointing downstream and over the gravel bund, at strategic locations to create flow diversity, juvenile fish cover and additional invertebrate habitat interest on the new inside bend. The penultimate and technically critical phase of the new ‘House Beat’ channel reconstruction involved the correct ‘sizing’ of the new long-term channel width. This was achieved by forming the new curving outside meander bank-face with gravel as seen in photo 58. Photo 58 The correct ‘sizing’ of channel width and ‘curvature’ of the new outside meander planform is critical in determining the long-term character and habitat quality of the watercourse. 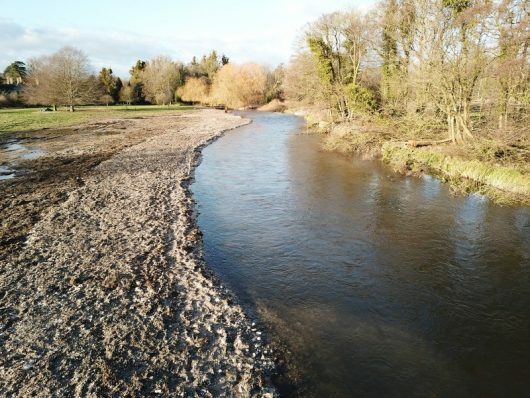 The final and crucial part of the operation and one which goes ‘hand-in-glove’ with the ‘setting’ of the new channel width, is the final dressing of the new river bed with gravel. The optimal depth-to-width ratio of the new watercourse in relation to gradient, flow volume(s) and anticipated heavy summer Ranuculus growths, requires careful consideration when establishing the final cross-sectional channel profiles. Gravel was deposited on the river bed throughout this reach in such a way as to create ‘pocket-water’ with an undulating and complex bed topography to provide multiple flow velocities and optimal holding and spawning lies for salmon and trout. A ‘choppy’ river surface caused by ‘hydraulic tension’ and ‘micro-flow-attenuation’ is one of the beneficial outcomes of careful flow management down this 1:450 gradient. Finished low-flow depths averaged 500/600mm, with a raised sloping bankside margin built-up approximately 400mm above existing water level to absorb higher winter flows and ‘pre-June-weed-cut’ displacements. Mid-summer water depths are expected to increase in proportion to volume-uptake by in-stream weed growths, such that water levels and angler bank access may, at times, be close to one another. This, being the character of healthy chalk streams and their adjoining water-meadows, is probably no bad thing! 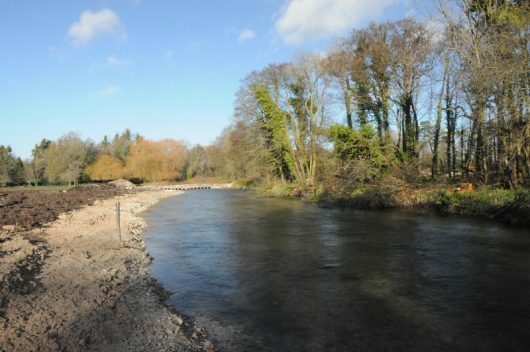 On completion of works the new gravel bank margins were graded over with river bed sediment and top soil to provide a fertile growing medium. The new marginal bank slopes are currently (March/April 2018) being seeded and planted up with ten or so native emergent species. Water-crowfoot (Raunculus), Water parsnip and Starwort will be re-planted by hand into the new river bed gravels ahead of the new fishing season and as soon as the high winter flows start to subside. 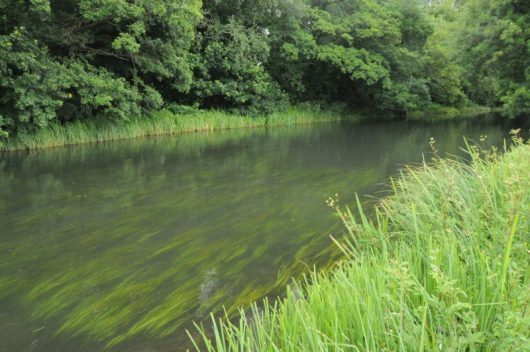 Re-generation of in-stream macrophytes is expected to be rapid given that optimal flow velocities have now been re-established in the rejuvenated reach. Photo 59 Upstream view of the restored ‘House Beat’ reach shortly after completion. The combined application of the above-described restoration techniques has enabled the restoration of this beat with little discernible loss of width as compared with the original width of the impounded channel. The new channel width will also ‘fill out’ still further once the in-stream ‘weeds’ start to flourish. Photo 60 Downstream view of ‘House Beat’ with its new outside meander. The sub-surface inside-meander gravel berm deflector can be clearly seen bottom left of shot. Photo 61 Upstream view of ‘House Beat Central’ from its fishing boundary with ‘Home Beat’. The sub-surface gravel inside meander berm can be clearly seen, bottom right of shot, over-laid with site-won branches to create marginal habitat interest. 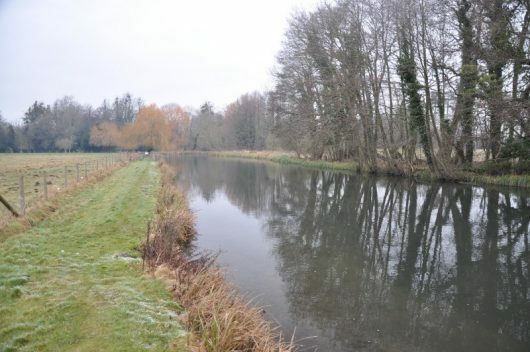 Note the judicious use of marginal in-stream tree cover which makes provision for significant areas of open water between the tree cover (LWD) and the true Left-hand bank (right of shot). A significant number of ‘leggy’ and light-starved Alders were also coppiced out of the adjacent copse throughout this length of river to open the east-facing canopy to allow more early morning light onto the river. Coppiced trees were left in situ to provide wildlife cover and decomposing woody material at ground level. Photo 62 This image provides a long view up the new ‘House beat’ meander to ‘Pipe Bridge Riffle’ and gives an impression of how the new alignment fits into the overall up-stream meander sequence layout.